PREMIUMS have gone through the roof for the supposed “insurance” that a quarter of all homebuyers have to pay when taking out a loan. Lenders Mortgage Insurance for a borrower with a typical 10 per cent deposit on a $500,000 property has risen from less than $6000 last year to nearly $9000, a surge of close to 50 per cent according to brokers Home Loan Experts. … LMI has been used in more than two million loans but is poorly understood and is rarely discussed in detail. It is charged whenever a borrower has a deposit of less than 20 per cent. Many of those who pay it don’t even realise it protects the bank, not them. In August 2011, then Treasurer Wayne Swan announced the introduction of a one-page fact sheet on LMI. Nearly two years on it still isn’t in place. It is “close” to being in place, according to the office of Assistant Treasurer David Bradbury. Incredibly, when it is, it won’t even nominate the cost. And it is unlikely to point out that LMI is neither portable nor refundable. That means any household looking to refinance with another lender faces paying thousands of dollars in LMI for a second time, unless they have at least 20 per cent equity in their home. Mortgage brokers and consumer groups say this is undermining the Government’s efforts to increase competition in the home-loan market because having to pay LMI again makes switching lenders financially unviable. … Home Loan Experts’ LMI premium increase calculations were based on comparing 2012 and 2013 rates for Genworth, one of the two major providers of lenders mortgage insurance in Australia. When contacted for comment, Genworth said all executives authorised to speak to the media were on holidays. QBE would not provide any information on its premium rates. However, a spokeswoman did say premium increases were due to elevated claim levels and higher reinsurance costs, as well as lower investment income. Lenders Mortgage Insurance is a perfect example of how our society is totally ruled by bankers. Banks are (exclusively) allowed to create new “credit” — backed by nothing — simply by typing new numbers into their computer. Banks are allowed to make profits by charging usury (interest) on that new “credit”, when they sign you up to a loan contract — which you must repay, or risk losing everything you own (bank-rupt). You have to pay for insurance to protect the bank in the event that you can not continue repayments of their “credit” + usury. You have to pay for that insurance again, if you want to transfer your 30-year debt+usury repayment obligations to a different bank. The “finance” game is completely rigged. Concerned about declining home ownership levels and a sharp fall in the proportion of buyers purchasing their first property, the Real Estate Institute of Australia (REIA) wants first homebuyers to be able to tap into their superannuation savings to help them scrape together a deposit. … The institute says recent interest rate cuts have had little impact on the desire of potential first homebuyers to enter the market. Er … hello?! Maybe that’s because Australian house prices — the highest on the planet — are simply too expensive? Maybe it’s because the younger, internet-savvy generations are discovering the truth about our world-leading housing Ponzi? Or maybe it’s because they do not want to be in debt to the bankers usurers for the rest of their working lives? The institute cites two schemes operating overseas – in Singapore and Canada – that allow first homebuyers to use their superannuation savings when they buy a property. … The REIA has also called on state and territory government to reverse the trend to only offer first homebuyers grants for new dwellings. “It’s excluding 80-odd per cent of people who have historically bought established homes,” [REIA President Peter] Bushby says. When it comes to keeping the flow of property buyers coming in at the bottom of the Great Australian Housing Ponzi scheme, supporting and driving up prices (and thus, their commissions from property sales), there really is nothing — no bald-faced lie, no cunning deceit, no twisting of the truth — that these filthy rotten morally vacuous scumbags won’t say. Perhaps it would be best for the common good if these people — along with the bankers, whose scraps they feed off — were all rounded up, taken down the back paddock, and their 100% self-serving thought processes “rebalanced” the good old-fashioned way. With a small high velocity lead weight implanted in the side of their heads. If you are not keenly interested in understanding and sharing the truth about the evil, deceitful, parasitic way in which the bankers’ debt-at-usury “money” system works, then you — your apathy, your ignorance, your disinterest — are a vital part of the reason why this predatory, cancerous system continues. Jessica Irvine is the National Economics Editor for News Limited. I’m moving in two weeks. Yep, it’s all cardboard boxes and roller tape at our house. Happily married for two and a half months now, we’re on to the next big adventure. Buying the dream home with white picket fence? No. Not for us. Not yet. We’re signing a 12 month lease and moving to an apartment in the city to be closer to work. You see, I’m part of Generation Rent – the generation the urge to buy property passed by. Where our parents see rent money as “dead money”, Generation Rent baulks at the idea of becoming mortgage slaves, shackled to the high interest demands of a supersized mortgage. Interest paid to the bank is as dead as any rent money. Far from frittering away our money, we’re actually showing a level of financial conservatism not seen since our grandparent’s generation. We’ll save now and minimise our debt burden later. We’ll step on to the property ladder eventually, if it suits us. And if we don’t have to pay more in interest to the bank than it would cost to rent. Jessica’s reasoning for her decision makes sound financial sense. And whether she realises it or not, it makes sound moral sense too. That is far more important. By choosing not to sign up for decades of debt slavery, by choosing not to pay “interest” to the vested usurers, she is striking a blow against The World’s Most Immoral Institution. And setting a wonderful moral example for others to follow. 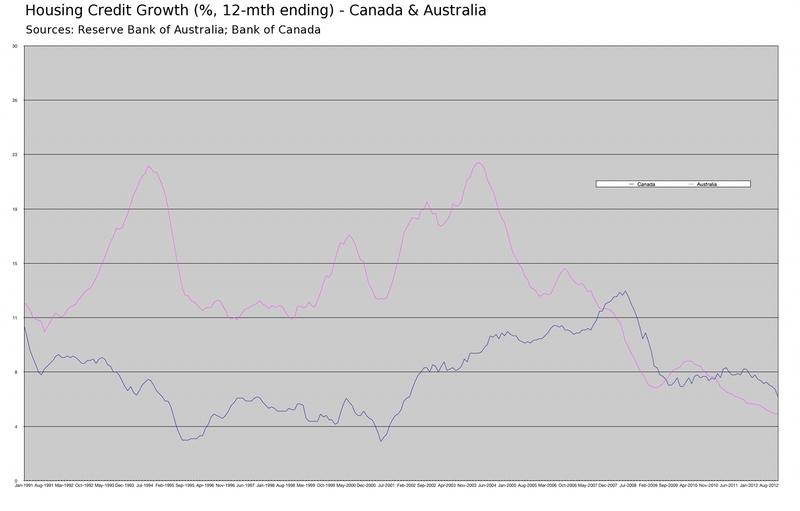 Australia’s And Canada’s House Price Fate Entwined? Ever since I first experienced the chilling majesty of the landscape and the warm conviviality of the people in that other former British colony, I have informed aspiring travellers that Canadians are just like us, but with an American accent. Today, I offer you a little proof of the truth of my assertion. Following my last post ( “The Easy Way To Know Where House Prices Will Go” ), a Canadian retweeted my article, along with the comment, “Coming to Canada”. Perhaps understandably for a Northern Hemispherian, he got it downside up. What’s happening with house prices now in Canada, is Coming to Australia. As you can see, the growth rate in Residential Mortgage “Credit” (ie, debt) in Canada topped out at 13% per annum in May 2008. 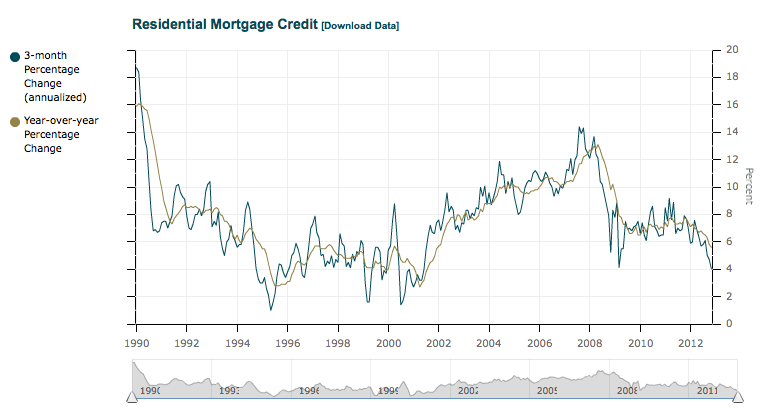 What caused that modest (compared to ours) slump in the growth rate of “Residential Mortgage Credit” (debt) in Canada? That’s right … something called a “Global Financial Crisis”. The critical growth rate in new “credit” lending did keep growing, mind you. Just like in Australia, it never actually went negative. But what is vital to understand is that, as in Australia, the rate of growth decelerated rapidly. Australian economist Steve Keen has empirically proven that the rate of change in the change in debt – meaning, the acceleration in growth of debt – is vital to keeping an “asset” price bubble inflated. It takes not just steadily growing debt – say, 5% per annum – but accelerating growth in debt, to keep enough new buyers armed with enough new debt to keep bidding prices ever upward. The Bank of Canada, aided and abetted by the Canadian government, got the public’s foot rather gingerly back on the borrowing gas, by slashing interest rates to 0.25% (April 2009) . You can see the result in the blue line of the chart above. It’s the area of flat / barely accelerating “credit” growth through to 2012. Since then though, the public’s foot has started to come back off the gas again. Why? Because the Bank of Canada started raising interest rates. 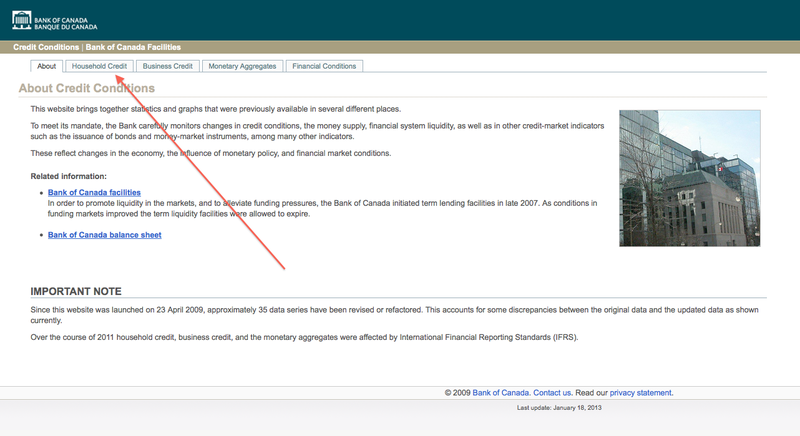 From June 2010, Canada’s official interest rate has quadrupled to a whole 1% (wow!). Following the GFC “peak panic” in late 2008 – early 2009, our Reserve Bank began raising interest rates again fully 8 months earlier than Canada. From October 2009 to November 2010, our central bank gradually increased interest rates from a GFC low of 3.25%, up to 4.75%. You can see the result of these interest rate movements as a small hump in the chart above (magenta line). Thanks to record low interest rates – and unlike Canada, a massive injection of (borrowed) cash home loan deposits as a result of the Rudd Government’s doubling of the First Home Owners Grant – Australia’s long deceleration in housing “credit growth” from the stratospheric heights of 2004 paused, and briefly accelerated again. It reached a mini-peak of 8.3% per annum in May 2010 (when interest rates hit 4.5%), before those rising interest rates once again took the Aussie public’s foot off the housing-debt-growth accelerator. The RBA began cutting rates again in November 2011, hoping to get us back on the borrowing gas, but to no avail. We are now back to 3% interest rates … lower than the GFC low … yet the housing “credit” growth rate is still decelerating. Watch out below? There are some other similarities between Australia and Canada. They too, are considered to have a “commodity-based” economy. Just like our own, Canada’s economy relies heavily on exporting stuff they either dig up or grow. Like Australia, this abundance of natural resources – and gargantuan Chinese “stimulus” spending to stave off the GFC – was a key factor in their economy (and house prices) not following the lead of the rest of the West. But perhaps the most disturbing similarity between the economies of our two former colonies is this. Euromoney magazine bestowed Canada’s Minister of Finance with their “World’s Greatest Finance Minister” award in 2009. The award is judged by leading European banking and finance magazine Euromoney on advice from global bankers and investors. 2006 to 2008 were indeed magic years for Euromoney’s awards selectors with “Best Investment Bank” 2006 going to Lehman Brothers who went broke in 2008. They’re blamed for much of the Global Financial Crisis. “Best at Risk Management” went to Bear Stearns who went bust in 2007. “Best Equity House” 2006 named Morgan Stanley and “Best Investor Services” favoured Citigroup. Both were bailed out in 2008. Just like our own Treasurer Wayne Swan, who received the award in 2011, Canada’s Jim Flaherty supposedly “saved” their economy from recession too. “I don’t mind prices coming down a bit, too,” he said in an interview, after the latest data showed that home sales fell sharply in December compared with a year ago. I wonder if The Goose (or the JHockey?) will respond the same way when Australia’s house prices respond similarly to our decelerating growth in housing “credit”. Yesterday, RBA Assistant Governor Guy Debelle indulged in some MOPE. Lies, deceit, and propaganda, in other words. But for those with an ear to hear, and an inclination to check the “authorities'” claims, what he really did – unintentionally – was to give us a heads up. That our Too Big To Fail banks (TBTF) are going to get bailed out, sooner rather than later. Go grab a modest quantity of your favourite beverage, and settle in. 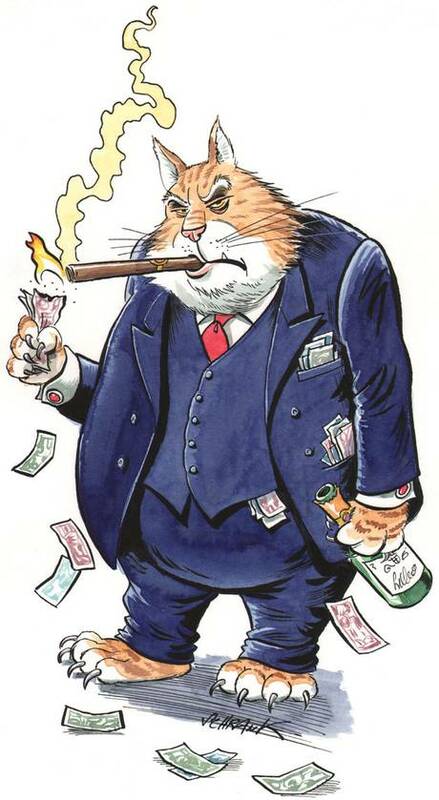 You are about to learn – in detail – why we cannot trust a word the banksters say. Our standards are more rigorous here at Barnaby Is Right. Today I am going to talk about a few interrelated issues concerning the banking system: collateral, funding and liquidity. The financial crisis brought into sharp relief the liabilities side of a financial institution’s balance sheet, that is, the funding structure. This had previously been somewhat neglected, but the fates of Northern Rock, Bear and Lehmans were clearly affected by the nature of their funding. While their funding structure played a significant part in the downfall of those institutions, I would argue the ultimate concern was about the quality of their assets. The funding problems were symptomatic of concerns about asset quality. The solvency of any bank first and foremost is a function of the quality and value of its assets. This is, of course, true of any entity, but it is particularly true for banks because of the implications asset quality has for liquidity and because of the leveraged nature of financial institutions. The crux of my argument today is this: if I am a creditor of a bank, my due diligence should be spent mostly on assessing the asset side of the bank’s balance sheet in determining whether or not I will get repaid in full. And by beginning his speech with this quite correct and valid talk of asset quality – and then not examining those “assets” in any detail – this is the clever game that Mr Debelle has played here. No doubt he expected that no one would actually bother to check the banks’ asset quality. They’d just take it on presumption, and Mr Debelle’s inference, that they’re fine. And indeed, none in the mainstream press have bothered to check. So let us do just that, shall we? Let us assess our Australian banks’ all-important “asset quality”. Just two days ago ( “Our Banks Racing Towards A ‘Bigger Armageddon'” ), we saw that our banks held a combined $2.68 Trillion in On-Balance Sheet “Assets” at March 2011. So $2.68 Trillion is the claimed “value” of their Assets. Now, about Mr Debelle’s “ultimate concern”. The all-important “quality” of those Assets. What exactly are these bank “Assets”? $1.76 Trillion (65.56%) of these “assets” are actually loans. That’s right – your loan is considered the bank’s “Asset”. They own you, as their debt slave. $1.018 Trillion (57.84%) of those loans, are Residential loans. That’s right – fully 38% of our banks’ Total “Assets” is the notional value of their loans given as mortgages. Now, in light of the recent housing-triggered banking and debt crises in the USA, UK, Ireland, Spain, and many other nations throughout the Western world; and in light of the fact that our property market is widely considered “the most overvalued in the world”; and in light of the fact that our property market has recently suffered its biggest quarterly fall in 12 years; and in light of the fact that arrears on mortgage payments have spiked to a record high, in the same quarter as house prices had a record fall … do you really think that having over 65% of your “Assets” in the form of loans, with 38% in the form of home loans, could be considered as high “asset quality”? In light of the fact that business failures have risen 25%, with more than 10,000 going under in 2010; and in light of the fact that a leading Australian businessman has said that Eastern Australia is in “deep recession” and NSW and Victorian manufacturing is “stuffed”; and in light of the fact that the only Australian economist to predict the GFC has recently said that we will “almost certainly” be in recession in the second half of 2011 … do you really think that having 24% of your “Assets” in the form of commercial (business) loans, and 4% in the form of personal loans, could be considered as high “asset quality”? In other words, do you really think that having over 65% of your Total “Assets” in the form of loans to households and businesses, who are all increasingly vulnerable to (eg) cost-of-living pressures, loss of employment, house price falls, and/or a recession, could be considered as having high “asset quality”? 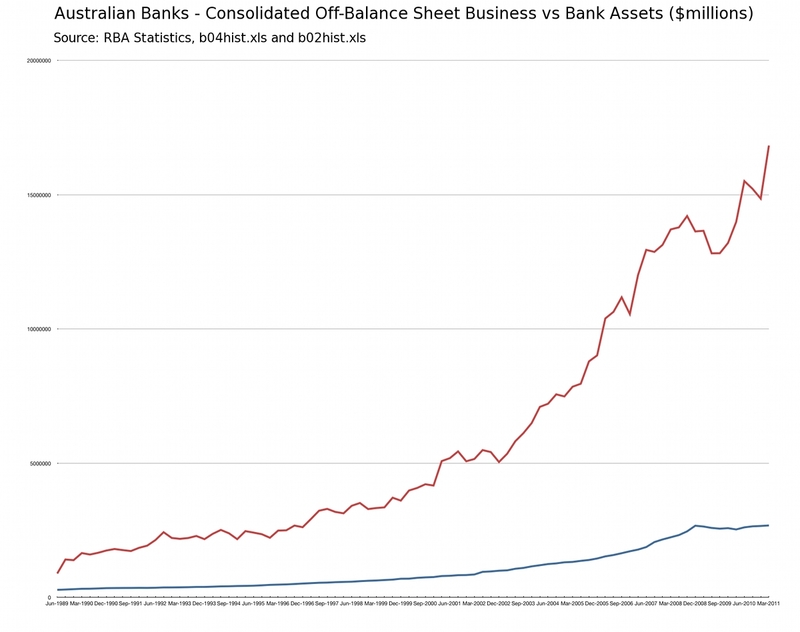 Our banks presently hold a staggering $16.83 Trillion in Off-Balance Sheet “Business”. That’s around 15 times the value of Australia’s entire annual GDP. And most of that Off-Balance Sheet Business, is in derivatives. The exotic financial instruments at the very heart of the GFC. These are the instruments of intergalactic-scale gambling that the world’s most famous investor, Warren Buffet, famously called “a mega-catastrophic risk”, “financial weapons of mass destruction”, and a “time bomb”. (They are also the reason why it is the banking industry that is pushing so hard for a CO2 trading scheme. Because for banks, it means trading in a juicy new mega-market casino, with a whole new type of “derivative” – carbon permits). Just 6 days ago, we saw the global head of HSBC’s foreign exchange division warn of “a bigger Armageddon out there”, in foreign exchange markets. And just 5 days ago, we saw a warning given by Fitch Ratings that Australia’s banks are the “most vulnerable” to Europe’s debt crisis, due to their heavy reliance on wholesale funding from abroad. Now, yesterday Mr Debelle contradicted the HSBC and Fitch Ratings’ warnings. While admitting that Australian banks’ reliance on funding from overseas does represent a foreign exchange risk, he argued that there is nothing to worry about. If a liquidity issue were to arise around this funding, it is of critical importance that the foreign-currency denominated funding is fully hedged into Australian dollars, which indeed it is. Now, that critical claim is one we should all take with a crate of salt. In supposed proof of his claim that our banks’ foreign exchange exposure is “fully hedged” into Australian dollars, Mr Debelle referred (in his speech’s footnote #9) to a paper that appeared in the RBA Bulletin, December 2009. Doubtless no one in attendance bothered to check that old paper. Certainly, not a single journalist who reported on Mr Debelle’s comments in the mainstream press bothered to check first, and then report the truth. In that old paper, we see that the authors did claim that our banks had their foreign exchange exposure fully hedged. And here’s the really crucial point. Mr Debelle’s referencing this paper in support of his claim is a nonsense – and thus, suspicious – simply because the data in that old paper is (obviously) now completely out-of-date! Mr Debelle must know this. 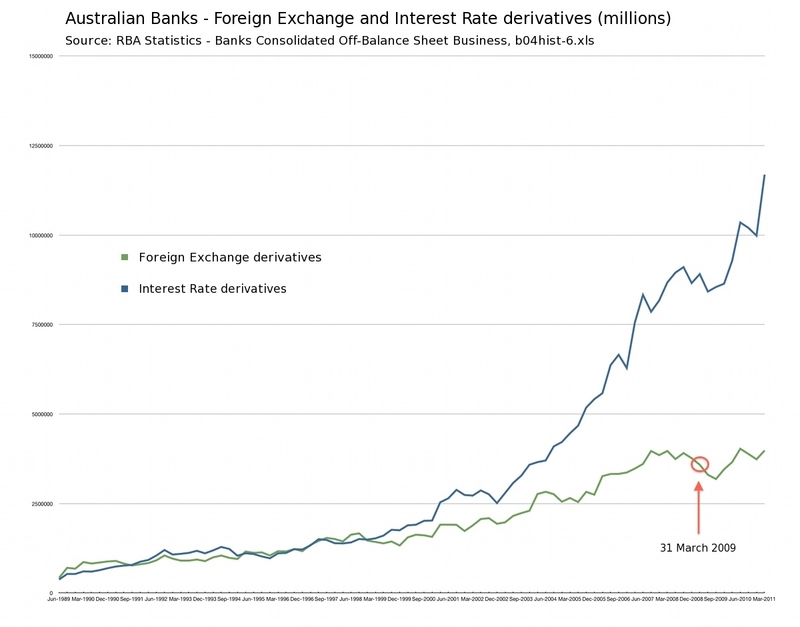 Because the RBA publishes its own statistical data for our banks’ derivatives exposure – and their most recent data is current to 31 March 2011. Moreover, the data used in that old paper was sourced via an ABS survey – that is, it relied on the banks honestly reporting their true positions (!?!). And, the data was only current to 31 March 2009 – more than two years ago. (a) Positive values represent derivative positions under which the holder will receive foreign currency in exchange for Australian dollars at a predetermined exchange rate (that is, a long foreign currency/short AUD position). Negative values represent derivative positions under which the holder will receive Australian dollars in exchange for foreign currency at a predetermined exchange rate (that is, a short foreign currency/long AUD position). As you can see, the breakdown of our banks’ foreign exchange derivatives “positions” at March 2009, was Long foreign currency $1.545 Trillion, and Short foreign currency $1.257 Trillion. For a net Long position of $288 Billion. And the counterparty to that $288 Billion Long “position” (ie, gamble) was … “Non-resident”. Now, a few important points to consider. Firstly, these 2 year old figures did not represent solid proof of a “fully hedged” foreign exchange position. And it certainly is not proof of that claim being true now, 27 months later, in June 2011! 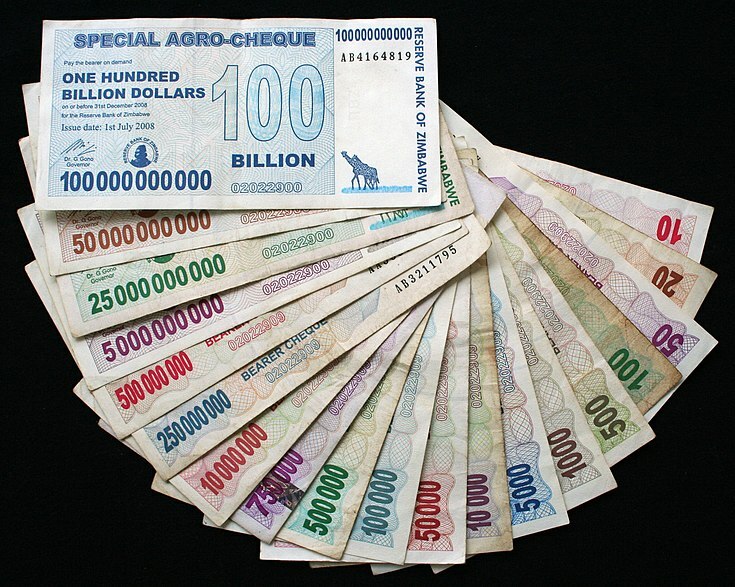 Instead, what it represented was a $288 Billion Long foreign currency position, at 31 March 2009. A net $288 Billion bet that foreign currencies would improve in value, compared to the Aussie Dollar. Secondly, why do you think Mr Debelle would seek to reassure us that our banks’ foreign exchange risk is “fully hedged”, and back his claim by reference (in the footnotes) to a 2 year old, redundant paper – just 4 days after Fitch Ratings warned of the vulnerability of our banks to foreign exchange volatility, and 5 days after the global head of HSBC foreign exchange warned of “a bigger Armageddon out there” in foreign exchange markets? Let us not even bother going into the huge question marks over this. Including very basic questions. Such as, why did the banks report a $2.80 Trillion FX derivatives exposure to the ABS survey … when the RBA’s own statistics report that they had a $3.58 Trillion exposure at that date (see highlight in chart above). Or, the basic question of why did Mr Debelle fail to reference the current, and much larger, foreign exchange derivatives exposure of our banks. And let us not bother going into the even bigger questions (and dire implications) over our banks’ $11.68 Trillion exposure to Interest Rate derivatives – that’s the going-parabolic blue line on the above chart. We’ve seen more than enough to know that Mr Debelle’s belated assurances about our banks are a sham. It is my view that Fitch Ratings’ and HSBC’s warnings are most likely closer to the real truth. And the reality of our banks’ extreme vulnerability, due to their off-shore funding reliance, their truly staggering derivatives exposure, and perhaps above all, their poor “asset” quality, is the real reason why Mr Debelle gave the speech that he gave yesterday. Whether he meant to or not, the simple message for the wise and prudent to take away from (the inconsistencies, lies, and deceptions in) his speech is this. He is essentially saying, “Don’t worry folks … our banks are going to fail … but the RBA can just print money to bail them out”. Don’t believe that printing money is what Mr Debelle was saying? As I discussed earlier, an Australian dollar liquidity issue can be addressed by the Reserve Bank. The Reserve Bank can meet a temporary liquidity shortfall by lending Australian dollars against the stressed bank’s assets denominated in Australian dollars. Where does the RBA get its dollars from, in order to “lend” support to our soon-to-be-insolvent, imploding banks? It creates them. Out of thin air. Click click on the mouse button. Tap tap on the keyboard. Just like all “independent” central banks. And then lends those dollars, at interest. As we have seen previously ( “Our Banking System Operates With Zero Reserves” ), thanks to the way our banking system is designed, printing more money is the only thing that the RBA can do in response to a bank insolvency crisis. And as we also saw previously, that is exactly what they did do, in the GFC. Welcome to the Grand Opening of our Zimbabwe Experience, dear reader. Brought to you by your friendly “independent” RBA banksters, and their Big Four cronies. It is particularly interesting that Mr Debelle was effectively reassuring everyone that the RBA is able to provide “liquidity support” (ie, money) for our banks in the event of their running into trouble with their wholesale funding from abroad. What he did not mention, is that our government – that is, we the taxpayers – has provided both explicit and implicit support for the banks through the Government Guarantee Scheme For Large Deposits And Wholesale Funding. So, if Mr Debelle is arguing/reassuring that the RBA is able to provide liquidity support for our banking system, then why is the Australian taxpayer on the hook to backstop the banks? And why did Mr Debelle not mention this very important fact in his speech? As with anything involving the “unholy alliance of politicians and bankers versus ordinary people”, everything about this stinks to high heaven. According to a recent report by Goldman Sachs chief economist, Tim Toohey, household debt levels in Australia now stand at an elevated level, both in relation to historic norms, and compared to other countries. For instance, Australia’s debt to household income ratio is higher than in the United States and Spain, and stands at a similar level to the United Kingdom. Toohey has written a perceptive report on the Australian housing market, in which he argues that housing prices are between 25-35 per cent overvalued. As a result, he says, we run the risk that Australia’s house prices could drop sharply if a sharp decline in Chinese growth prompted a steep drop in our export earnings. There’s more than one way to look at this very interesting revelation. 1. The “independent” RBA has a vested interest in fuelling Australia’s property bubble – which helps to explain the low interest rate policies of the early 2000’s that so helped to encourage excessive borrowing and real estate speculation. 2. The “independent” RBA has a vested interest in keeping the property bubble afloat – so that RBA officials do not suffer capital losses on their existing property portfolios. 3. My favourite. The “independent” RBA has a vested interest in first fuelling a property bubble with low interest rates – meaning officials make profits on the way up – and then, collapsing the property bubble at a time of their choosing (by raising interest rates), so that officials can buy in to the property market again (and buy up even more), after prices have fallen dramatically. One can only wonder about the investments of “independent” RBA Governor, Glenn “$234k Pay Rise At GFC Peak” Stevens. Has he profited from his Board’s decisions on interest rates? Will he personally profit by (again) raising interest rates into the teeth of an onrushing GFC 2.0? Next time you hear an RBA official like Stevens talking about interest rates, or the housing market, just remember this article. And remember that, whatever happens to the housing market, it is those same “independent” RBA officials who know what is going to happen… before you do. 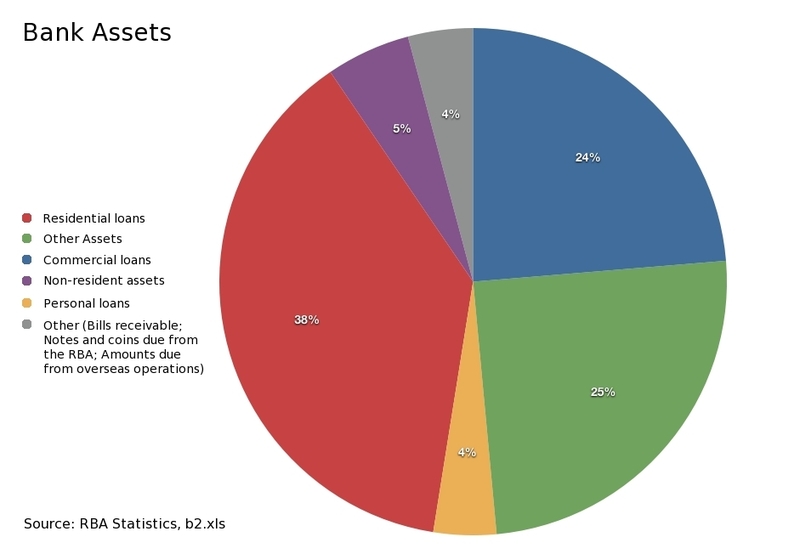 Recently downgraded banking system with $15 Trillion in Off-Balance Sheet “Business” (derivatives) versus only $2.66 Trillion in On-Balance Sheet “Assets” … 66% of which “assets” are actually loans. Australia “almost certainly” in recession in 2nd half of 2011. With eastern Australia already “in deep recession” and NSW/VIC manufacturing “stuffed”. Warnings of a “perfect storm” of fiscal woe “by 2013 at the latest” from the man made famous for predicting the GFC. Confirmation that the USA is defaulting on its debts (just as Barnaby warned in 2009). Warnings that our biggest customer China is likely to experience a “hard landing”, with a 60% chance of the trigger being an internal banking crisis. Warnings that China and our second biggest customer, Japan, are set to slow … or implode. A blithering idiot RBA Governor who “does not know anyone” who predicted the GFC, but still in charge of setting interest rates. Having learned nothing from his screw up in raising rates into the teeth of the 2008 GFC. And keen to raise them again. Our banks being warned for even more reckless lower lending standards, in trying to keep their property bubble-fuelled ponzi scheme from collapsing. And both major parties planning to steal our super to pay down ever-rising, all-time record public debt. This is “How Australia Will Look When The SHTF”.